We are regulars at this hidden gem in Lone Tree. Via Baci opened in 2009 when there wasn’t much else around the area, now they are next to the Lone Tree Arts Center and Sky Ridge Hospital so it’s a little harder to get a table but well worth the wait. The service is always outstanding and the food spectacular! Via Baci also offers a nice variety of Colorado microbrews and a wine list with monthly specials. Tuesday & Thursday night is 40% off wine night so we like to go then! A glimpse of my food dudes birthday feast. Some of our current favorites dishes include the Lasagna, Caprese Salad, any of the pizzas and the Creme Brule’. I ordered the house made sangria last weekend and it was fabulous! I’ll be struggling to decide between that and the St. Supery wine next time we go. Our first visit to Via Baci in 2009 at a soft opening / tasting. Forgive the bad photography, this was before the good iPhone cameras. 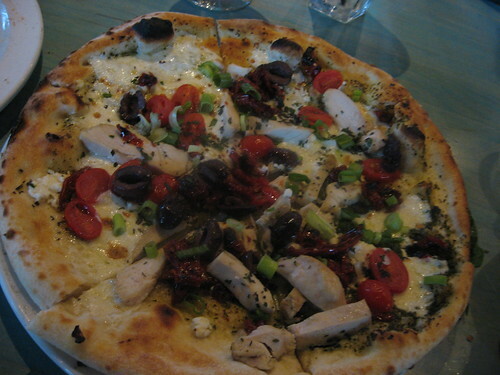 The Chicken Bianco was very good, many different flavors melded perfectly and it seemed very healthy with the thinner wood-fired crust. 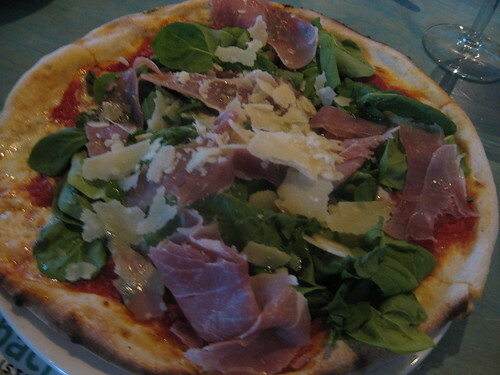 Of the many we got to taste that night, a favorite was the Prosciutto E Rucola- good size pieces of prosciutto, fresh mozz, large strips of basil, arugula on their homemade San Marzano tomato sauce..DELICIOUS!! Great atmosphere! the smell of the pizza cooking in the 700-degree oven, the smell of cooked garlic in the air and the staff was very attentive. Shea was our waitress and she was just AWESOME! Oh and did I mention they make the mozzarella fresh daily! What a concept?? We highly recommend Via Baci to anyone who enjoys a great meal, super wait staff and likes a nice atmosphere! 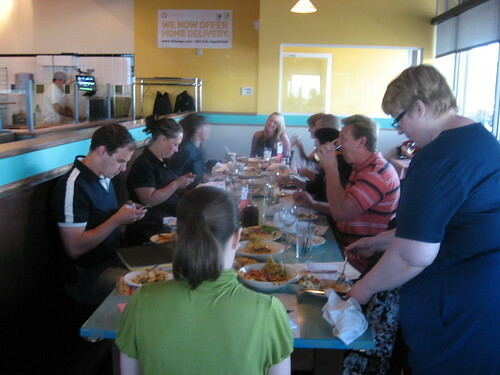 This picture was taken in 2009 during their soft opening at a social media food tasting. We just went last week for an early lunch and they do now have some breakfast pizzas, as well as mimosa’s and house-made Red & White Sangria. Come to Via Baci Restaurant and have a pizza with some Colorado Micro Brew or a bottle of Vino.. you won’t be sorry.